One of the modules available on the MSc Public Health programme at GCU London is the Work Based Advanced Skills and Innovative Practices which makes up 15 credits of the overall degree and runs for one trimester. As a ‘work based’ module, it aims to support students as they acknowledge and overcome challenges in their workplace. The content of the module is determined by the students’ own specific learning requirements and promotes a flexible approach to continuous professional development. After completing the module, students should be able to critically analyse the influence of political, legislative and policy issues on the public health issue they have chosen, whilst adopting a proactive approach to Public Health practice and demonstrating the ability to contribute to professional discussion. 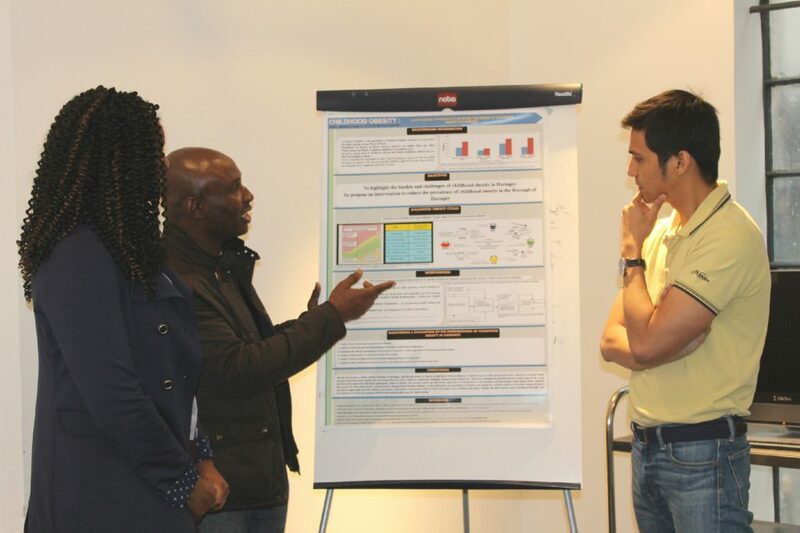 Last trimester, MSc Public Health students who undertook this module, designed and created an interactive health promotion poster on a topic of interest; a very common method of presenting information within the sector. Students worked in groups of two or three and attended a number of scheduled lectures led by Dr Razak Abubakari who provided support and guidance throughout the module. It was then up to the students to complete the project in their teams using their own initiative! Students Rizal Alaydrus, Onyebuchi Charles Joseph and Sheila Mwarabu selected the topic, ‘Childhood Obesity’. Working as a group, they researched the subject using scientific journals and factual articles and assimilated the information so that it was clear and concise to their target audience. Within the poster they included the aims of the health promotion, background information on childhood obesity, visual aid (such as graphs and images) and intervention techniques and procedures to address the challenges. A ten minute (assessed) presentation was then given to the rest of the class.